Although the company has a truly British heart, its roots are in California. 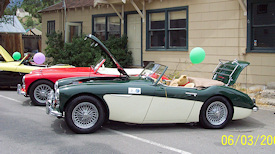 Started by Norman Nock in Daly City in 1958, the business specialized in repairing British cars and moved to San Francisco soon after its opening. Built on a firm reputation of British car repair expertise, the business developed a loyal following and sustained growth. In their April 1999 issue, Healey Marque magazine provided an enjoyable, in-depth discussion of British Car Specialists' rich history. With their permission, this article has been published on our web site for your enjoyment. Click here to read their report. Norman semi-retired in 1995 but sill comes into the shop daily to lend his knowledge and create our hand drawn Catalogs. The business in now owned and operated by David and Sheila. David runs the service department while Sheila runs the office and oversees the parts department. Started by Norman Nock in Daly City in 1958, the business specialized in repairing British cars and moved into San Francisco soon after its opening. 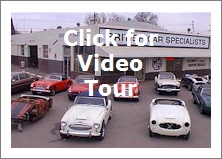 In 1971 Norman was offered and opened a British car dealership in Stockton. Sheila Huggins, Norman Nock's daughter, started in the business by filing and answering phones. Sheila started working in the parts department in 1979. After college, Sheila assumed the responsibility of running the office and overseeing the parts department. Norman’s son, David, helped in the garage by sweeping floors and cleaning parts. Later he served his apprenticeship in the shop and has attended numerous dealer training schools and became a qualified British car mechanic.